I work in health care and work closely with quite a few cancer patients. I see all types of different cancers including lung, head and neck cancers, breast cancer, stomach cancer and more. Depending on the patient, their goals and the type of cancer they have, I help to provide them with the best nutrition plan possible. Part of one of my Door to Door Organics orders. I order the medium box since we love produce. Depending on where someone is in their treatment, the goals can greatly vary. If someone is getting chemotherapy and having nausea, for example, my goal for them would be to eat whatever sounds good since they often do not want to eat. Someone with head or neck cancer may need softer foods and it may even be easier for them to drink their calories as it can be painful to eat. What I love about being a dietitian it is that there is no "one size fits all" nutrition plan. Each plan and goal for a patient greatly depends on many factors which makes my job quite interesting. For those who are feeling quite well, they may be able to focus on nutritious foods for a healthy lifestyle. Once they are in remission, cancer patients often want to know what to eat to help prevent any recurrences of cancer and so that they can feel their best. 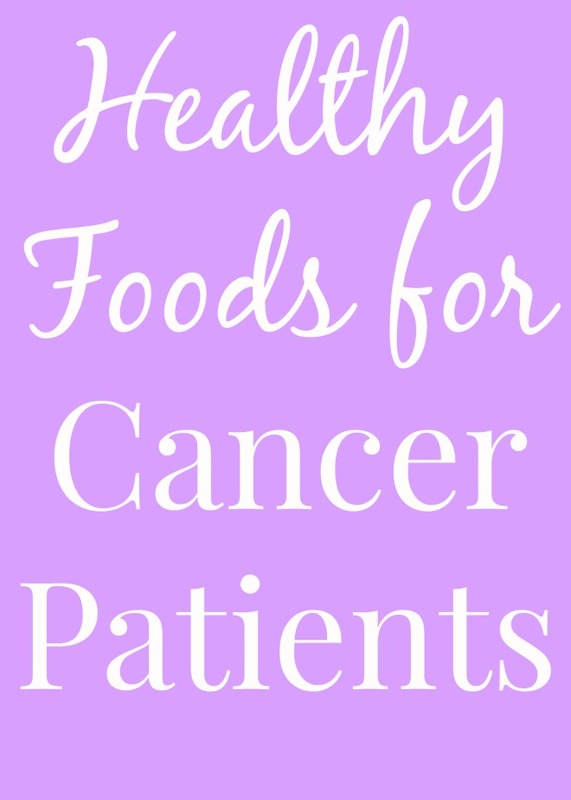 These healthy foods are not only great for cancer patients but for anyone wanting to live a healthy lifestyle. Healthy foods for cancer patients include a generally healthy diet with a focus on fruits and vegetables, whole-grains and lean proteins. Antioxidants help to prevent cell damage caused by chemical reactions with oxygen. Antioxidants include vitamins A, C, E and selenium. Those who eat a diet rich in fruits and vegetables may have a lower cancer risk. Great sources of antioxidants include blueberries, leafy green vegetables, carrots, sweet potatoes, broccoli, bell peppers, citrus fruit and more. These Greek Meatball and Zoodle Bowls use very lean ground beef. Saturated fat may increase the risk of cancer. Evidence does not show that other types of fat increase cancer risks. Instead of eating foods rich in saturated fat (meat, high-fat dairy products, fried foods), focus on foods rich in monounsaturated fats including canola and olive oils, avocado, peanuts, nuts and seeds. Omega-3 fatty acids are great choices as well including fish, walnuts, chia seeds and flax seeds. When choosing which meats to buy, choose lean meats such as boneless, skinless chicken breasts, lean turkey products, low-fat beef, etc. Aim to have 2 to 3 cups of vegetables and 1 1/2 to 2 cups of fruit each day. Eating a variety of produce is your best bet to get all of the nutrients that you need- eat the rainbow! Eating a produce rich diet has been linked to lower risks of oral, esophageal, lung, stomach and colon cancer. This 3-Ingredient Strawberry Banana Ice Cream is a lower sugar dessert that is packed with produce and tastes delicious! Added sugars provide extra calories and can cause weight gain which may increase your cancer risk. Look for sugars of all kinds including honey, brown sugar, agave, corn syrup, molasses and more. Beverages are often high in added sugars. Choose water, milk or unsweetened tea instead of drinks such as pop or energy drinks. Foods with added sugar are often low in nutrients. Replace foods rich in added sugars with nutrient rich foods. This Kale Caesar Pasta Salad is loaded with fiber with whole-grain noodles, beans and vegetables! This goes along with eating more fruits and vegetables which are naturally rich in fiber. Other fiber rich foods include whole-grains such as whole-wheat bread and pasta, beans, nuts and seeds. There are two types of fiber: soluble and insoluble. Soluble fiber helps to lower your heart disease risk by lowering your cholesterol levels. Fiber is also great for a healthy digestive system. If you know someone with cancer in your life that is wanting to eat nutritious foods, consider making them a gift basket full of nutritious foods and deliver it to them. The Kindness Campaign urges you to great a gift basket for a cancer patient including bringing them a meal that they may not be able to prepare on their own. We actually have a family member who was just diagnosed with cancer and we are going to be bringing them and their family some meals. During a time of stress and illness, the last thing that you may want to do is prepare meals and we hope to be able to help them in this small way. This post is sponsored by the law firm Environmental Litigation Group, P.C. which primarily focuses on cases dealing with asbestos-related injuries and handles cases with diligence, personal approach, proactive counseling and advocacy through extensive experience. Founded in 1990 and located in Birmingham, Alabama, the law firm provides legal representation nationwide and builds a trust-based relationship with each client. Offers free consultations.